Corticeira Amorim has been on our watchlist for a couple of years. Since January 2014, the stock has nearly quadrupled in price (€2,25 to €11). In December 2016, our team performed an analysis to see whether the stock would still be a ‘buy’. 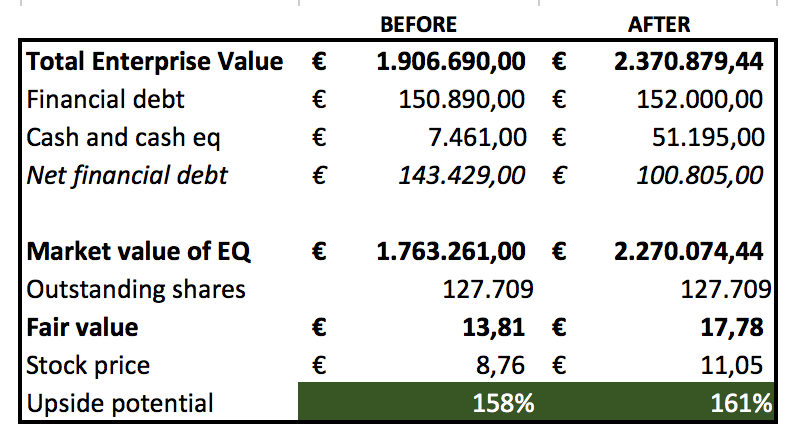 At that point, we concluded the fair value to be €13,8 based on a DCF valuation model. It held a 58% upside potential, convincing us the safety margin was strong enough to put some skin in the game. The stock was added to our basket of 2017 stock picks and has returned over 30% since January 1st 2017. In this post, we will go over some essential financials and reveal whether the stock is still underpriced or not. 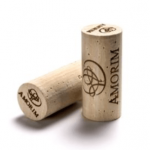 Corticeira Amorim SGPS SA (Corticeira Amorim) is a Portuguese holding company, active in the cork industry. It has been a frontrunner in this segment for over 140 years. Even though it supplies 25% of all wine cork stoppers in the world, it has diversified the portfolio over 5 different business units. In 2015, total cork exports stood at 1430 million. Portugal is by far the world leader in the sector, having a share of over 60% or 900 million EUR in the total worldwide exports. 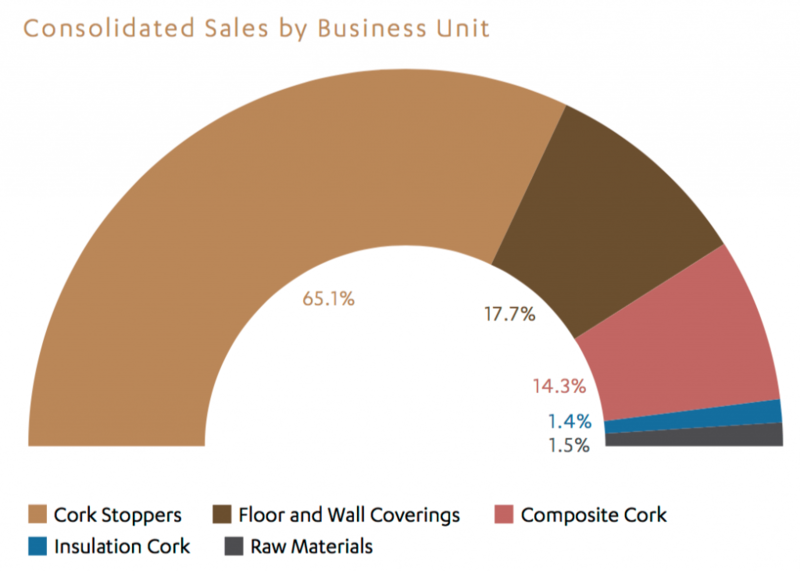 70% of these exports are wine cork related, amounting to 640 million EUR, with building materials making up 230 million EUR. It is worth mentioning that the company emphasizes stakeholder value creation. In the annual report, before addressing the stock market performance, multiple pages are dedicated to environmental performance and human resources. Being a family-owned company, and having existed for over 146 years, this is no surprise. As you can read below, this focus on stakeholder value has in no way damaged shareholder value creation, quite to the contrary. To show you how the company has overperformed relative to our expectations, we will compare a statement from our Dec 16 report to what we have seen in the 2016 annual results. The main driver of additional value is a more rapid increase in Sales and faster than expected cost cutting, resulting in better EBITDA/Sales figures. Sales increased by 7,8% from 560m in 2014 to 604m in 2015…COGS increased from 286m in 2014 to 307m in 2015, an increase of 7,3%. 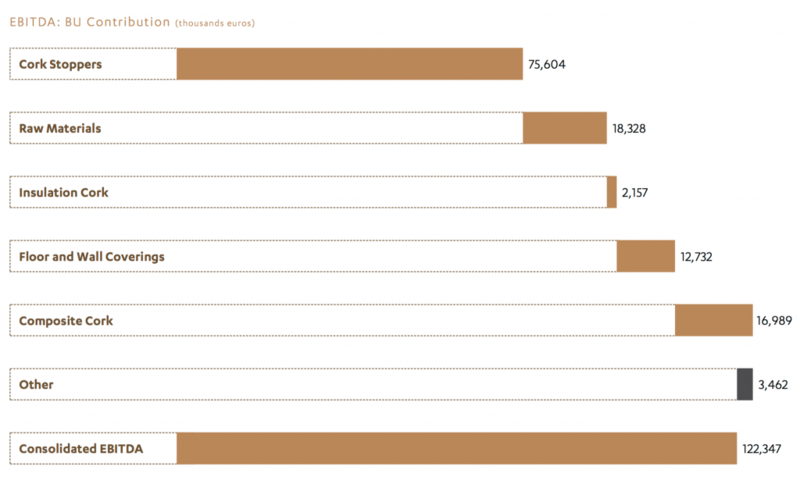 It is worth noting that interest costs halved from 4m to 2,1m over the same period. Sales increased by 6,05% from 604m in 2015 to 641m in 2016…COGS decreased from 307m in 2015 to 294 in 2016, a decrease of 4,2%. Interest costs declined yet again from 2,1m to 1,65m. Net profits increased from 55m to 102m or with nearly 80%. The net profit margin skyrocketed from 9,1% to 16%. Our previous DCF analysis returned a fair value of €13,8. The stock currenly being priced at €11,05, this still means 25% upside is present. We don’t feel this is a big enough margin of safety. Therefore, we would like to recalculate the fair value based on the 2016 annual report. The two calculations will be presented side-by-side. Faster efficiency gains and higher sales growth have led to higher EBITDA, and therefore cash flow in 2016. During our previous analysis, we expected sales in 2016 to come in at 631 million with an EBITDA/Sales of 18%. In reality, however, sales amounted to 641 million with an EBITDA/Sales ratio of 19%. Building further on this, all of our future free cash flows are significantly higher. Whereas the value of free cash flow in 2020 was 67 million in our previous model, it now stands at 84 million. Cash flows are discounted to present value using a WACC of 5,3%. We have recalculated the current WACC to be 4,99%, but as 5,3% was already exceptionally low, and out of reasons of prudency, we decided to stick with 5,3%. Sales growth is estimated at 5% per year until 2020, while in reality the company seems to do better. From 2020 onwards, the terminal growth value is 2%, in line with normal economic growth figures. The high inflow of cash substantially lowered Net financial debt of the company. After doing our DCF analysis, we concluded that the fair value of one Corticeira Amorim share is €17,8. This offers investors an upside of 60% at current market price of €11,05. Of course, this doesn’t mean that the stock will reach this value anytime soon, but it gives us confidence that the margin of safety is large enough to add to our position. The Q1 results of the company have recently come in. We can already see the positive trend continuing. Remember that for our DCF analysis, we estimate a growth rate of 5% per year until 2020 and 2% onwards from there. Any growth rate stronger than this adds even more to the upside potential. This seems to point that in our analysis, we are still underestimating the true strenght of the company. But even when using these prudent numbers of 5% growth and 20% EBITDA/Sales for the next 4 years, the stock seems to be undervalued by the market. Even though the stock has already gained 30% in 2017, we still believe it to be undervalued. When comparing the price with our old model from December 2016, there is 25% upside left. 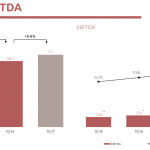 But when updated with the newest figures, where the company has shown resilience in cost control while growing revenue, this increases to over 60%. This is calculated with rather prudent numbers in comparison with what the company has reported in Q1 2017. All in all, we believe Corticeira Amorim is a world-leading company in a niche sector which will show strong growth in the future. It has very low debt, keeps innovating and has a strong economic moat. Read their annual report here. Skip to page 100 for the consolidated statements. Disclaimer: The author owns shares of Corticeira Amorim.